The Vienna team was interviewed by South-Tyrolean radio RAI about DYLAN and specifically about its ELF RT. More information and a web link to the feature in question will be made available as soon as it is aired! The Austrian DYLAN team was interviewed on the newsletter of the University of Wien, about the role of the English language in a multilingual Europe. You will find the entire article on the website of the University of Wien. A user-friendly guide for the use of Slovene language in EU institutions, by the University of Ljubljana. We would like to announce a recent publication made by the Slovene partners of DYLAN. University of Ljubljana scholars Marko Stabej, Mojca Stritar and Jordi Magrinya are three of the 5 authors of this user-friendly guide for the use of Slovene language in EU institutions which was written at the request of Slovene authorities. The short manual, partly based on DYLAN findings, is aimed at Slovene civil servants working in the Council and Parliament. It incorporates both the governmental experience in EU procedures and the results of its analysis carried out by the Ljubljana team, conducted within the DYLAN project. Le projet DYLAN a fait l’objet d’une présentation dans le cadre du Forum organisé par le Conseil Européen pour les Langues, qui s’est tenu à Bruxelles le 5 décembre dernier, sous le titre “Intégration, expansion et globalisation - un nouveau défi pour l’Europe”. 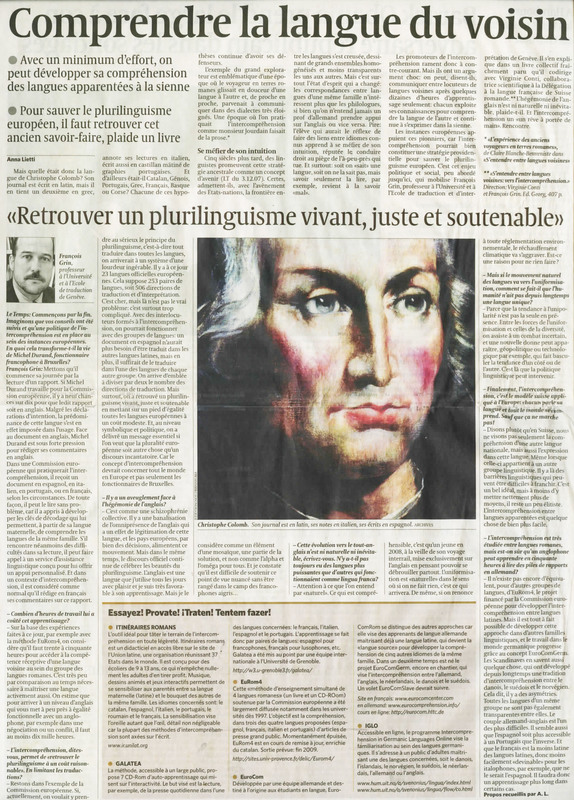 Dylan researcher and coordination team member François Grin was interviewed by the Swiss newspaper "Le Temps" last October. This article "Comprendre la langue du voisin (understand the neighbour's language)", deals with the issue of the "inter-comprehension", a subjet treated by Grin in a book recenly published in collaboration with Virginie Conti ("S'entendre entre langues voisines: vers l'intercompréhnsion", Ed. Georg.). Will it be possible to speak to a person with a language different from but close to ours after just some days of adaption? If you wish to learn more about this subjet, you can read the full article here. 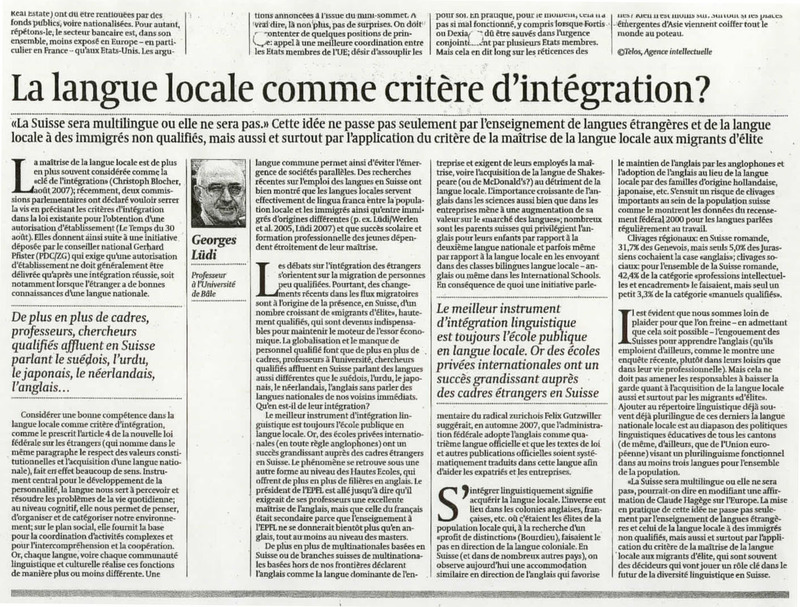 Georges Lüdi interviewed by the swiss newspaper "Le Temps"
In a multilingual context, as the Swiss one, the immigration of foreign language users and the increasing predominance of English - especially in leading positions - introduce a new debate: Should one introduce a unique lingua franca, despite of the multiligual tradition of Switzerland or should immigrants rather be encouraged to learn the language of the region where they decide to stay? This is the subjet of an article by Georges Lüdi, DYLAN researcher and deputy coordinator, published in the Swiss newspaper "Le Temps". Here you will find the complete version of this article. We would like to announce the publication of the book of abstracts of the Sociolinguistic Symposium 17 which took place in Amsterdam in April 2008. Once again, DYLAN members played prominent roles with University of Geneva and University of Lancaster professors François Grin and Ruth Wodak being members of the scientific committee and several Dylan researchers (Alexandre Duchêne, Matthias Hüning, Michal Krzyzanowski, Vicky Markaki, Sara Merlino, Lorenza Mondada, Florence Oloff, Véronique Traverso and Ulrike Vogl) presenting their work. We are happy to announce that RT 4.2 will offer a joint DYLAN-LINEE-colloqium together with the Vienna LINEE team at the 'Österreichische Linguistigtagung', organised by 'verbal' (the Austrian Association of Applied Linguistics), 6-8 December 2008 in Vienna. The idea of this colloqium is to first generally present the two projects and highlight parallels/differences, and then home in on the individual teams' research foci (see the German abstract). Barbara Seidhofer interview with "Der Spiegel"
Barbara Seidhofer, responsible of the Wien University team, has been interviewed by the German review "Der Spiegel" about the matter of English as a global language. Here you can find a link to the "Der Spiegel" official website, where you can have a look on the complete interview. An einem Treffen mit dem EU-Kommissar für Mehrsprachigkeit und dem österreichischen Bundesminister für Wissenschaft und Forschung. Wir haben erneut gute Nachrichten in Sachen dissemination activities aus Wien zu vermelden: Barbara Seidlhofer wurde am 13.12. eingeladen, an einem Treffen mit dem EU-Kommissar für Mehrsprachigkeit, Leonard Orban, und dem österreichischen Bundesminister für Wissenschaft und Forschung, Johannes Hahn, in Wien teilzunehmen. Diese Gelegenheit hat Barbara natürlich beim Schopf gepackt, um das DYLAN Projekt und seine Forschungsziele vorzustellen. Le projet DYLAN sera présenté par le Prof. Georges Lüdi au Congrès International de Linguistique et Philologie Romane, qui se tiendra à Innsbruck du 2 au 8 septembre. Résumé de la présentation.